This year as we learn to cook and savor healthy whole foods, we’ll also be sharing our Culinary journey with you! 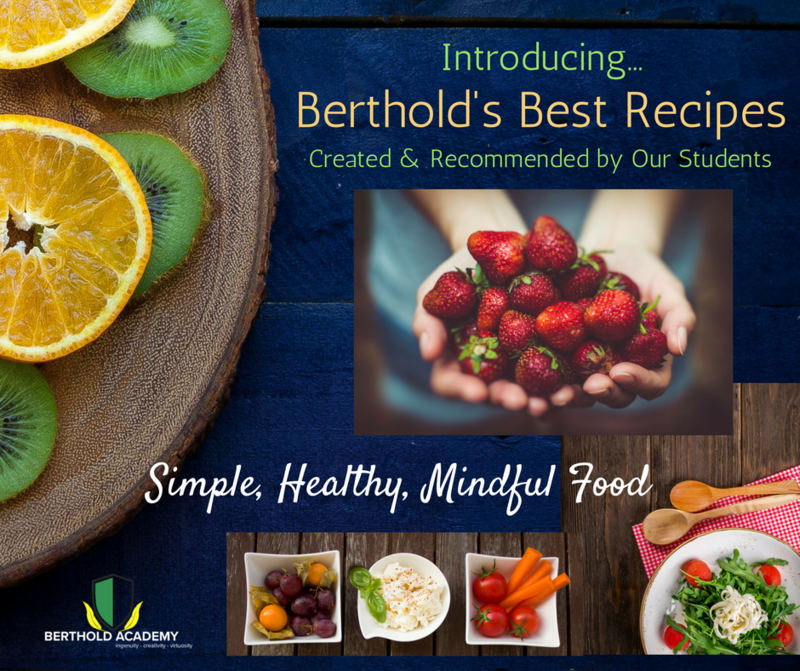 For the last several weeks, Berthold Academy students have worked in teams, using simple “formulas” as the basis for designing their own green smoothies and bean dips/hummus with vegetables. We’ve completed our Green Smoothie experiment, and would now like to introduce you to the first in a series of student-designed recipes that you can enjoy also! As you’ve probably already experienced, students are coming home with cooking assignments so that they share their growing culinary skills with family. Expect both successes and failures with the opportunity for a lot of lighthearted learning (and growth) along the way! The key is to keep it simple, have fun, and explore the many flavorful combinations that natural foods have to offer. The current focus for Trimester One is exploring simple combinations using plant-based foods: fruits, vegetables, beans and eventually whole grains. So we started with simple green smoothies and a challenge to only use fruits and greens like kale and spinach. We want students to become more comfortable experimenting independently in the kitchen, learning to adapt recipes using the specific flavors they like best and, in the process, increase intuitive cooking skills that build over the course of the year. Another main intent of this first trimester is to encourage eating more simply and choosing whole foods so that we decrease dependence on processed food (e.g. packaged snacks and pre-made meals). As we’ve moved on to bean dips/hummus, we’re pairing our recipes with sliced vegetables like cucumbers, carrots, and sweet red peppers (instead of crackers or processed breads). Look for our recommended recipes coming soon! We’ll be building upon these themes all year, moving to one-pot cooking during winter, where the students will learn about soups, stews, stir-frys, healthy fats and animal proteins. And, just as importantly, we’ll be emphasizing the role that meals in community and mindful eating play in our health. By spring, we’ll be ready to design our own meals and cook with local foods gathered from our own garden, farmer’s markets, and CSAs. I’ll be posting the top recipes to the website as the teams complete them all year, so you can follow along. Mr. B has asked me, also, to periodically contribute a blog like this one, letting you know more about the current emphasis in Culinary and also our Mindfulness programs. The main pages also contain some suggested videos for exploring these topics further. Enjoy!